Coach Philip Fernandes in conversation with his charges. 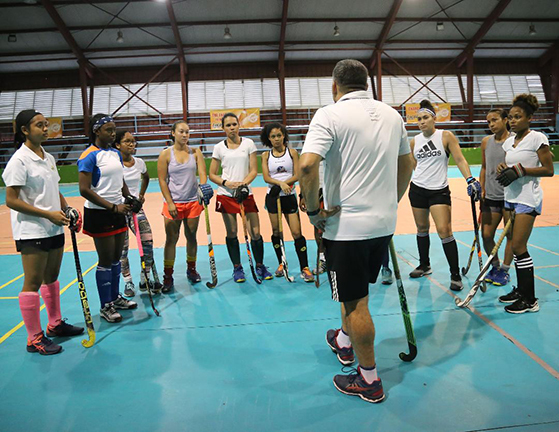 The Guyana Hockey Board (GHB) yesterday announced a 12-member female National indoor squad to participate in the upcoming Field Hockey Canada (FHC) Invitational Indoor Hockey Tri-Nation series scheduled for March 22to 24. The squad, which will depart Guyana tomorrow includes GCC Bingo Spartans exciting trio; Abosaide Cadogan, Sarah Klautky and Makeda Harding who are three of Guyana’s promising female players. The trio was selected with an eye on the future, giving them exposure to topflight competition where they can embrace the rigours of international hockey. “The Guyana Hockey Board, in using this event as a preparation for 2020 and beyond have opted to give the opportunity to new, young players who show the potential to be good representatives of the country for the future. ….